It’s not just Basu who is under the CBI searchlight. Agency records name NDTV CEO Prannoy Roy as a beneficiary and the CBI is currently firming its case against him. Says V. Lakshmi Ratan, additional secretary, DOPT: “The case will be against both the bribe-giver and taker. Roy will definitely be in the CBI dragnet if the agency finds evidence against Basu.” And the CBI’s blotter of charges—though not new—can be potentially very damaging. At present, the agency is looking into two allegations: that in 1990, Basu as director general, Doordarshan, took the arbitrary decision to place a news-programme, The World This Week—produced by Prannoy Roy’s NDTV—in the ‘A’ category for the purposes of sponsorship and in the ‘A Special’ category for spot buys. This decision, according to this year’s annual Public Accounts Committee (PAC) report, cost the exchequer a whopping Rs 3.52 crore. […] The situation gets hairier for Basu since legal experts within the agency are almost unanimous that Basu’s employment with Star TV—which, incidentally, has a tie-up with NDTV—on what is said to be a whopping monthly salary of Rs 15 lakh only three days after he left government service, establishes the fact that he was a beneficiary. Surely, our culture and democracy couldn’t be so feeble. Hence the government seems to have adopted a more legalistic means to stop Star TV in its tracks. They’ve picked on Basu, once the government’s favourite bureaucrat, today the bad boy of babudom who’s sold out to Murdoch the marauder. Peer envy? Some elements in the bureaucracy agree. It is pointed out that when the DTH ban notification was issued, Basu, accompanied by Prannoy Roy and Rajat Sharma, had rushed to the prime minister who, in turn, had hauled up three senior bureaucrats—cabinet secretary T.S.R. Subramaniam, telecom secretary V.K. Gokak and the then information and broadcasting secretary N.P. Nawani—for issuing a sensitive order without consulting the PMO. That got the bureaucracy’s goat and the ministry of personnel and the CBI were asked to fix Basu for good. Every available missile has since been fired at the Star TV India CEO—the rule book, an ultimatum to remit office within 15 days, the threat to set the CBI on his trail. It did spread panic—Gary Davey flew down to Delhi twice, Murdoch flew into Hong Kong to take stock and Star’s ally, Prannoy Roy’s NDTV, faced the prospect of being sucked into the vortex of the raging controversy—but, as things stand, Basu is still in the saddle and fighting. The case against him is that as a former DD chief, he is privy to the national broadcaster’s long-term plans. But one has to be spectacularly gullible to swallow that line: the only secrets that DD can possibly yield for the benefit of its rivals would be about how not to run a network. It is, after all, a badly-managed outfit whose policies have less to do with market realities and its public service broadcasting aims than with the whims of its political bosses in Shastri Bhavan. The Central Bureau of Investigation (CBI) has filed a case of criminal conspiracy against New Delhi Television (NDTV) managing director Prannoy Roy, former Director General of Doordarshan and present Chief Executive Officer of Star TV R Basu and and five other top officials of Doordarshan. The First Information Report (FIR) filed on the basis of “source information”‘ says that the undue favour granted to Prannoy Roy had led to a loss of approximately Rs five crore to Doordarshan. The FIR filed in the court of Special CBI judge Ajit Bharihoke alleges that the officials of Doordarshan had “entered into a criminal conspiracy at New Delhi during 1990-1996 with Prannoy Roy with a view to cause favour by abusing their official position.” According to the CBI charge-sheet, DD suffered a loss of over Rs 3.52 crore due to the “undue favours” shown to NDTV as its programme The World This Week (TWTW) was put in `A’ category instead of `special A’ category. The Company and its promoters have also been named in an First Information Report (FIR) filed by the Central Bureau of Investigation (CBI) in January 1998 against certain DD officials in relation to certain violations of rules by DD officials pertaining to certain programmes produced by the Company for telecast by DD. Till date, no case has been instituted against the Company based on the investigation carried out pursuant to the FIR. 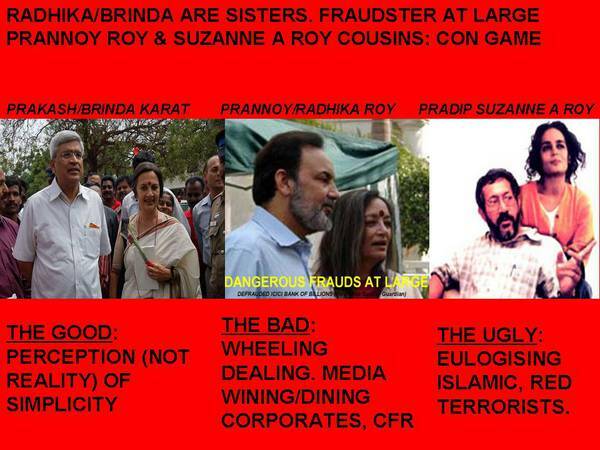 Another wrongstreet the government is getting into is going after Murdoch through Prannoy Roy and R Basu. Sushma Swaraj has said that she is letting loose the CBI to look into the undue benefits provided to NDTV by DD when he used to provide the state network with programming. An issue that has been simmering for the past couple of years but has got nowhere. It’s about time, the authorities stop their tomfoolery and get over their Murdoch fixation. Information & Broadcast Ministry, Doordarshan and discretion Despite the recent public focus on the misuse of ministerial discretion, nothing seems to have changed. A case in point is the information and broadcasting ministry. In the recent past, Doordarshan has turned many including Prannoy Roy to Vinod Dua into millionaires. And many more constantly knock at its doors for make-me-rich-overnight contracts, especially where commissioned programmes are concerned. This entry was posted on Monday, February 14th, 2011 at 3:15 pm and is filed under Uncategorized. You can follow any responses to this entry through the RSS 2.0 feed. You can leave a response, or trackback from your own site. Excellent. I appreciate that writer has taken time to document so much little known stuff. gr* job… but u need to be more aggressive in exposing the uncouth media nd its misdemeanors! Excellent Eyeopener…!! Keep it up dear.I appreciate the writer for in-depth investigation. Respect to anyone who quotes Hayek. Its a bit baffling so to speak. Excellent research with eye to detail. Wow, this is a great article. I hope more investigations are done on this. We need to get rid of these media outlets.